Thank you very much, rogueNoodle!! Fantastic game! 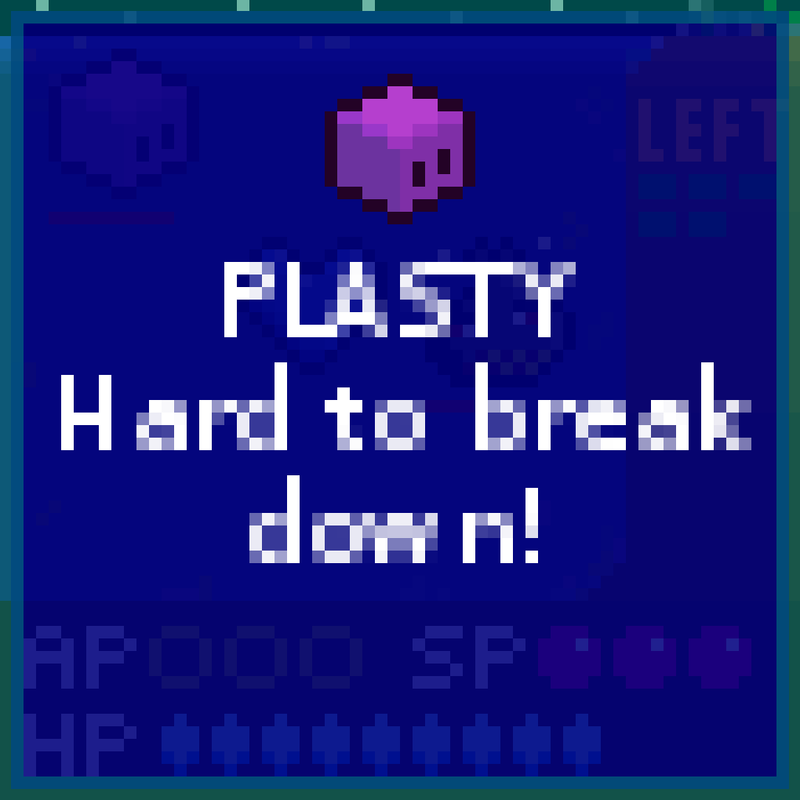 Very fun turn-based mechanics. Terrific audio and visuals, and a super fun strategy element. The one thing I would change is making the fonts easier to read. It felt like they were bitmap fonts that were scaled up so they lost some clarity. I found the last boss impossible to defeat. (Maybe that's the point?). I really like your message and you conveyed it in an enjoyable (and pretty adorable) way! Thanks, I'm really glad you enjoyed it! The last stage & boss are definitely tricky, but great job getting that far. I definitely agree on the text readability... it's one of my biggest regrets with this project. I was originally planning to draw all of the info pop-ups, but I ran out of time to do that or find a better low-rez font to print with. Next time for sure. If that's your only regret then you can safely say you had a successful and solid game jam :) I'm sure we all know that feel of running out of time, haha. Really nice game. The visuals are nice, the music and sound effects are appropriate, and the gameplay mechanics are very interesting. I love the variety of different enemies that make you approach battles in different ways. The one thing I don't like is there seems to be a bit of luck involved. Is the special attack random or do I just not understand it? Anyway, I made to stage 8. Stage 8 is nearly the end, but it is pretty tough! Nice job getting that far. Great little tactics game! I did find that the bosses left a little to be desired: Greed and Apathy were the only two that felt like they presented a unique challenge; the earlier bosses were mostly just a damage race and so you won/lost based on how you performed in the level up to that point. Overall though, it's a solid entry! Good analysis, and true. Gluttony and Invasive Species can kinda screw you if you were counting on collecting nearby fish, but they otherwise play the same as the rest. 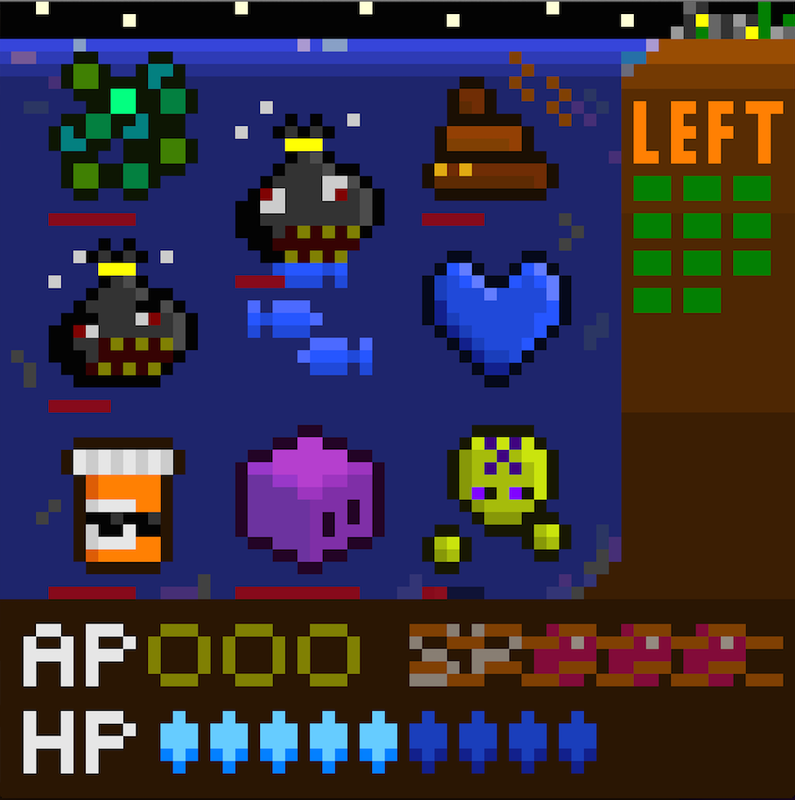 Making bosses more interesting is definitely a goal for the next version! I'm hoping that giving the player more interesting abilities creates more opportunities to experiment with the enemies, also. Anyway, good job finishing it & thanks a lot for your feedback! Man, where do I start? This is one of the best games I've played in this jam and this is the best game concept I've seen lately. Yes it is really that good. You can also see the author made with love, paying close attention to detail, with some fun animations here and there. Please keep working on this game and ship it to mobile. Id love to help in any way. Im jealous! 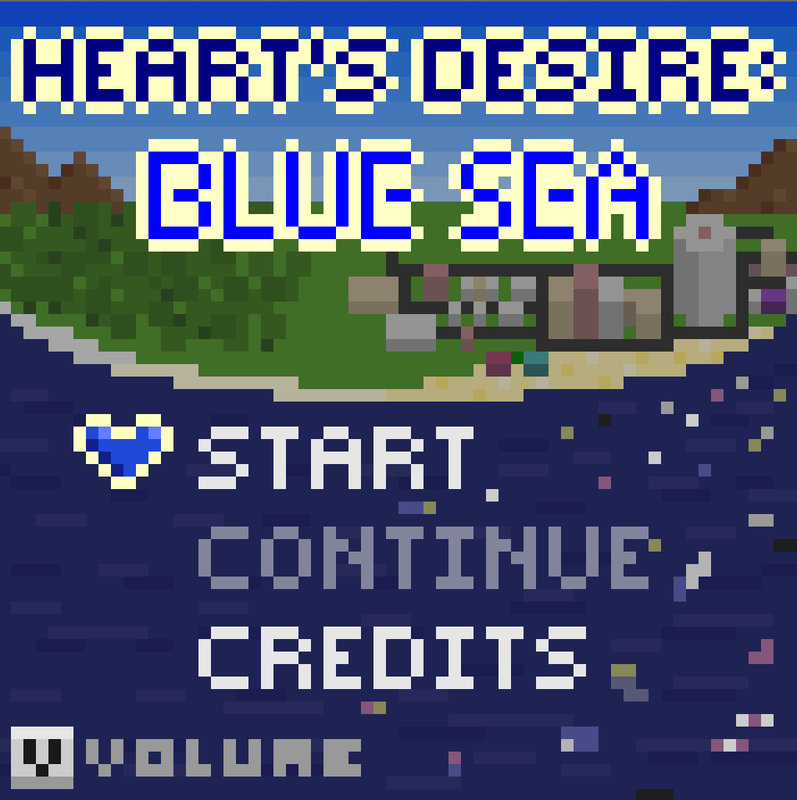 Moving forward, I would change the main char from a blue heart to some kind of mascot/hero people'd identity themselves with. Thanks so much, Diego! I really appreciate it. I'm glad you could tell the game was "made with love", because that pretty much summarizes my whole design philosophy. It's a thing I look for in games, too. I'll let you in on a secret: this entry was basically a 1st prototype for a mobile RPG I've been designing for years. I wanted to test out some of my "micro-tactics" combat ideas and figured this jam was a good time to do so. The next prototype will probably be similar to this one, except bigger, prettier, and designed for mobile devices! Great overall entry. Gameplay was fun and engaging. Though I managed to go into each boss fight with enough health, there didn't appear to be a way to regain health during a boss fight. Maybe some smaller minions you can retreat and pick off for some health gain. Some bosses have that! ;) Although the adds are more of a hindrance than a boon, haha. 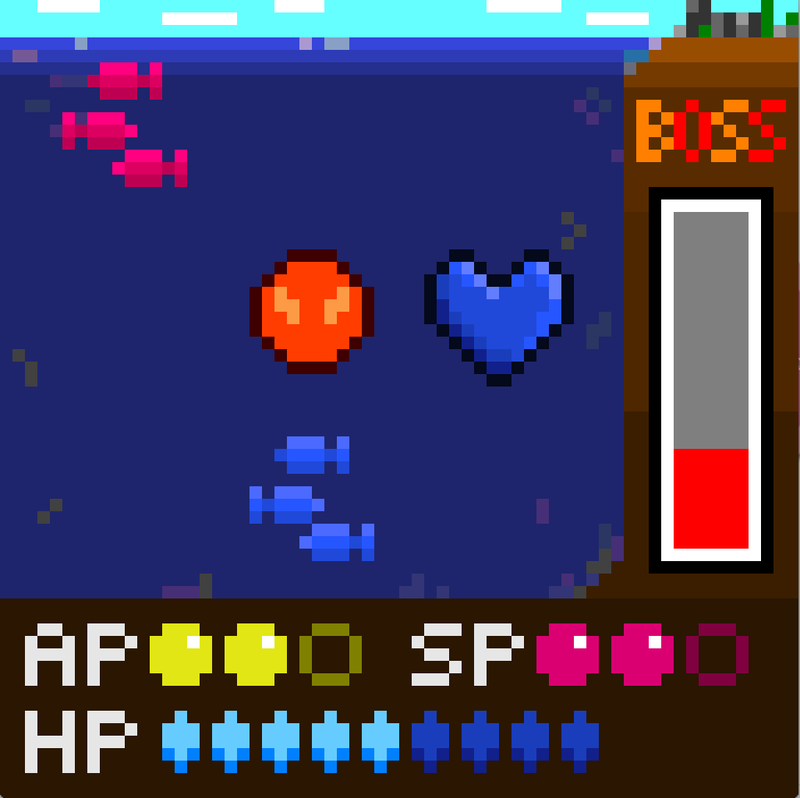 If I'd had time to implement powerups, there would have been healing, for sure, both manually and enhanced "fish-healing". I will almost definitely include those in future versions... although the bosses will also get harder, hehe. Thanks a lot for the feedback, I'm glad you liked it overall! I was hoping I will not be the only one with turn based game. Great art and usage of so little space! Thanks! I agree, turn flow feels a little bit awkward before you get used to it. I hoped the day/night cycle would clarify that, but it's really easy to miss when the 3-pixel sky changes color! This game is really fun! I loved the audio and the gameplay is intuitive and engaging. Congrats!! I'm glad you liked it, and thanks! Very nice game! It took mea while to learn but when i did, it was so fun! Good job! WASD or arrow keys to move. Moving into an enemy makes you attack it. Press V repeatedly to reduce the volume. If you're defeated, you can Continue from the same level as long as you don't close the game!